It's late(ish) if that is a word. I officially just finished my last deliverable for work and turned on my out of office. It's vacation for the next 10 days and I am PSYCHED! I am drained of energy from almost 2 years of running ragged. My little one was born January of 2012 and prior to that my last full week of vacation was August 2011. Yes, I had 3+ months maternity leave last year but that was no vacation. So this week off has been highly anticipated. I am no fool. I know my kids will still be whining at my feet and my blackberry will still be buzzing, but it'll be on a beach and in a house that doesn't have closets staring at me begging me to organize them. So, hopefully I can relax a little. I seriously need it. I stayed focused all week to get things in order at work so I don't have anything hanging over my head that would bug me while I was out. I still have things open at work of course...never will there be a day when everything is crossed off the list. Get It Done Tip: I sent an email to key people at work Thursday reminding them I was going to be out and giving an update on where things stood and what other steps I planned to do before I officially logged off for vacation Friday COB. It gave people the opportunity to make comments/ask for additional items and I still had a day to deliver on it. I sent my final update today in the afternoon and made note of my next step for items all of which will happen on or after September 3rd when I return. I sent this early enough for people to read it and in most cases I got back a "have a great vacation!". It felt good to have things in order and know that expectations are set that yes, I am around if you need me, but unless it's urgent we can chat when I return. After work I ran out for a pedicure, picked up some wine and went to the store to get some fruit and snacks for our car trip. When I got home I went into the fridge to slice up and freeze whatever veggies were still in there. Despite my sauce from yesterday I still had a ton of stuff. Huge zucchini and a bunch of peppers. I cleaned them, sliced them and froze them. I made a mental note I can pull them out for dinner one night to toss on the grill as a side dish. 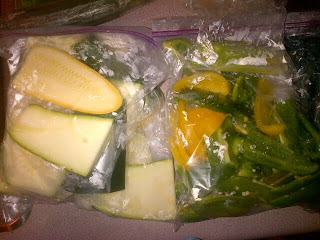 Until we meet again peppers, zucchini and leeks!